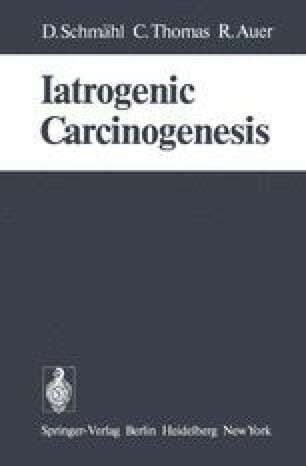 In recent years iatrogenic carcinogenesis has become an important field of iatrogenic pathology (Geyer, 1955; Druckrey, 1956; Schmäht, 1959; 1972; Uehlinger, 1961; Olbert, 1962; Lampert, 1964; Spain et al., 1967; Truhaut, 1967; Belpomme et al., 1972; Thomas, 1972; Goertt1er, 1972; Karrer and Wrba, 1972; Clayson, 1972; Waldenström, 1974; Deichmann, 1975; Preussmann, 1975). It is difficult to establish a relation between a specific therapy and the occurrence of a tumor, because these tumors often have latency periods of several years or even decades and because man is exposed continuously to various environmental carcinogenic factors. Therefore a syncarcinogenic action of both a specific drug and various other carcinogens has to be considered in most cases.